Keynote speakers: Professor Laura Salisbury (University of Exeter) and Dr Roderick Bailey (University of Oxford). This entry was posted in Talks & events and tagged Conferences, events, history of medicine, interdisciplinary, medical humanities on 16 March 2018 by matkinson. Recent arrivals at the Wellcome Unit Library: new books on surgery, syphilis, pregnancy, medical experimentation and global medicine! To consult any of our collections, contact us to arrange your visit to the library. ‘The gripping story of how Joseph Lister’s antiseptic method changed medicine forever’. Medical schools, operating theatres, hospitals, mortuaries and graveyards provide the setting for Lindsey Fitzharris’s account of Lister’s pioneering discoveries. Fitzharris concentrates on a quarter-century of dramatic change in the practice of surgery, from 1850-1875. Lister’s work on germs and infection in this period brought together science and medicine in a world where recovery from medical operations was often a matter of luck. Described as ‘the first large-scale interdisciplinary study of syphilis in late Victorian Britain’, Monika Pietrzak-Franger’s book explores the disease in medical, social, political and cultural contexts, reflecting on how images and discussions of syphilis played a role in constructing individual and collective identities. The study highlights the dichotomy of visibility and invisibility surrounding syphilis: as an invisible virus which could produce highly visible symptoms, a disease which was highly debated in medical circles but difficult to diagnose and treat, and a source of private shame which was publicly referenced in various mediums of literature, art and music. This book features chapters by specialists on the history of medicine in China, the Islamic World, North and Latin America, Sub-Saharan Africa, South Asia, Western and Eastern Europe, and Australia and New Zealand, with starting and ending chapters framing the discussion. To begin, Mark Jackson discusses a challenge faced by historians of medicine: the need to take a global perspective whilst adequately considering the impact of specific local and temporal conditions. In the final chapter Sanjoy Bhattacharya takes smallpox as a case study for the way these two dimensions should be integrated, arguing against ‘constrained global histories’ (p.257) which concentrate on powerful official health campaigns and assume worldwide trends but neglect the nuance of regional and local voices. Looking at medical writings, plays, poetry, novels and popular pamphlets, Jenifer Buckley explores the trope of ‘maternal imagination’ in the eighteenth century: the belief that a pregnant woman could use their mind to influence the development of their unborn child. Beginning with the fascinating case of Mary Toft, a woman who claimed to have metamorphosed her unborn baby into a rabbit, Buckley traces the ways in which maternity was viewed as performance in this period. For authors, the idea of maternal imagination linked to debates about gender, power and the interaction between mind and body, and pregnant women became a stage on which these concerns could be addressed. This new study looks at how the discoveries of nineteenth-century gynaecologists such as John Peter Mettauer, James Marion Sims and Nathan Bozeman were informed by medical experimentation on enslaved black women and Irish immigrant women. Deirdre Benia Cooper Owens tells the stories of these women using a variety of sources including medical journals, oral history interviews, newspapers and hospital records. Cooper Owens looks specifically at the destructive ‘medical fictions’ created to justify exploitation, such as the theory that enslaved black women were more resistant to pain than white women, and more broadly at the ways slavery, medicine and science were intertwined, and how American ideas about race, gender and bodies in this period influenced medical practice. This entry was posted in Collections and tagged collections, history of medicine, new books on 8 February 2018 by matkinson. This Monday’s seminar will be given by Professor Megan Vaughan (UCL), who will be speaking on ‘A research enclave in 1940s Nigeria : the Rockefeller Foundation Yellow Fever Research Institute at Yaba, Lagos, 1943-1949’. When? Monday 29th January, 16:00. Tea and coffee will be available in the Common Room from 15.30. The HSMT Seminar series is convened by Professor Rob Iliffe, Dr Sloan Mahone, Dr Erica Charters, Dr Roderick Bailey and Dr Atsuko Naono, of the Wellcome Unit for the History of Medicine. This entry was posted in Collections, Talks & events and tagged history of medicine, Seminars, Talks & Events, Wellcome Unit Seminars on 26 January 2018 by matkinson. When: TODAY, Monday 20th November at 4pm. Tea and coffee will be available from 15:30 in the Common Room. Seminars convened by Professor Rob Iliffe, Dr Sloan Mahone, Dr Erica Charters, Dr Roderick Bailey and Dr Atsuko Naono of the Wellcome Unit for the History of Medicine, Oxford. More information about this term’s seminars can be found here. This entry was posted in Talks & events and tagged First World War, history of medicine, military, modern history, Talks & Events, Wellcome Unit Seminars on 20 November 2017 by matkinson. Welcome to the first in a series of blog posts showing off the collections of the Wellcome Unit Library, Oxford! Being interdisciplinary in nature, the history of medicine offers fascinating opportunities to view disease and medical treatment through time in various social and cultural contexts. This means that although we are a small and specialised library, our books come under a wide range of subject classifications, from BL (religion) to U (military science), via JC (political theory). Robert Burton’s The Anatomy of Melancholy (1621) is an essential text for understanding early modern attitudes to illness and cure. Melancholy was understood as an ailment of body and soul, and Burton suggested that the experience of reading about the condition in his book could have curative powers. Mary Ann Lund argues that Burton’s approach has a lot to tell us about the history of reading and the relationships between reader, author and text. Looking at the diverse influences behind Burton’s conviction, including early modern medical writings, she presents Anatomy as a literary, medical and religious text which defies easy categorisation. Originating in a collaborative research project by members of the Universities of Northumbria and Newcastle, this edited volume reads literary works by writers such as Maria Edgeworth and Jonathan Swift alongside medical books, letters and diaries, to consider how people ‘fashioned’, or ascribed meaning to, diseases and causes of death in this period. A distinction can be observed in 18th century society between ‘fashionable’ and ‘unfashionable’ diseases (consumption and ‘ennui’ were generally listed in the former category, plague and smallpox in the latter), and literary works played a role in creating, reinforcing and subverting these categories. Part of the ‘Corporealities: Discourses of Disability’ series, this book links the prevalence of characters with disabilities in Victorian fiction to a wider cultural trend of melodramatic representation of disability, also seen among doctors and educators, and asks what this can tell us about 19th century society and culture. Holmes’s study looks at writers including Charles Dickens (who used the character of Tiny Tim as a sentimentalized shortcut for his message of charity and social justice), Wilkie Collins, Dinah Craik and Charlotte Younge, alongside other sources from the same period including autobiographical accounts from people with disabilities. Using evidence of Thomas Hardy’s own experience and understanding of physical and mental illness, Tony Fincham reviews the place of illness and medicine in Hardy’s fiction, making particular reference to the GP protagonist of The Woodlanders, Dr Edred Fitzpiers. Fincham highlights Hardy’s ‘consistent and continuous forefronting of psychological factors in the aetiology of illness’ (p.117), concluding that Hardy favoured a holistic, emotionally aware approach to medical matters. If you would like to consult any of the books held in the Wellcome Unit Library, contact us to arrange your visit! This entry was posted in Collections and tagged collections, history of medicine, resources, shelf selection on 13 November 2017 by matkinson. Abstract: In 1947, the Cornell psychiatrist Keeve Brodman and a handful of colleagues began developing what would become one of the most widely used health questionnaires of its time—the Cornell Medical Index (CMI). A rigidly standardised form, the CMI presented 195 yes-no questions designed to capture the health status of ‘the total patient’. Over the following decades, Brodman’s project of standardising medical history taking gradually evolved into a project of mathematising and computerising diagnosis: out of the CMI grew the Medical Data Screen (MDS), an early computerised method of deriving diagnoses from patient data. At the same time Brodman was beginning to work towards the MDS, another research team, headed by the television pioneer Vladimir Zworykin, was developing a computer program that they hoped would make accurate diagnoses in the field of hematology. This talk examines these two early efforts to computerise diagnosis as entry points into a larger discussion of the role of computers in shaping our definitions—and ultimately our experience—of disease. When? : Monday 13th November at 16.00. Tea and coffee will be available from 15.30 in the Common Room. Seminars convened by Professor Rob Iliffe, Dr Sloan Mahone, Dr Erica Charter, Dr Roderick Bailey and Dr Atsuko Naono of the Wellcome Unit for the History of Medicine, Oxford. This entry was posted in Talks & events and tagged history of medicine, Seminars, Talks & Events, Wellcome Unit Seminars on 10 November 2017 by matkinson. The McGovern Lecture is hosted annually at Green Templeton College, and focuses on the history of medicine. You can find a list of past McGovern Lectures here. Professor Edgar Jones (Instutute of Psychiatry, Psychology & Neuroscience, King’s College London) will deliver this year’s lecture, Shell Shock: understanding psychological casualties from the battlefield. The scale of the First World War, and in particular the high numbers of killed and wounded, marked the conflict as one of the most significant events of the twentieth century. For the first time, psychiatric casualties were not only a medical priority but also presented as a military crisis. In a protracted war of attrition, shell shock had the capacity to erode morale and undermine the fighting strength of the major combatants. Some senior physicians, such as Gordon Holmes, interpreted shell shock in the absence of a head wound as little more than cowardice, whilst others, including Charles Myers and Frederick Mott, explored ideas of psychological vulnerability and sought to correlate its symptoms with traumatic exposure. Clinical presentations differed between armies. In the UK, shell shock was commonly represented as a movement disorder, characterised by tremor and unusual gaits. This stood in contrast to Germany and Italy where seizures and dissociated, soldier-like actions were more commonly reported. Possible explanations for these national differences will be discussed in the context of combat medical services. Where: E P Abraham Lecture Theatre, Green Templeton College, Woodstock Road, Oxford. This lecture is free for all to attend, but booking is essential: book your seat here! This entry was posted in Talks & events and tagged history of medicine, Talks & Events on 20 October 2017 by matkinson. Next week’s Seminar in the History of Science, Medicine and Technology will be delivered by Dr Emese Lafferton, on the topic Sciences and cults of the mind: hypnosis, psychiatry and modernity in Austro-Hungary. Dr Lafferton is Assistant Professor in the Department of History at Central European University, Budapest. Her general research interests include the history of life sciences, psychiatry, eugenics, racial thinking, evolutionary theories, hereditary theories, physical anthropology and ethnography; the history of science, empire, and nationalism; the history and sociology of medicine. In this talk Dr Lafferton will first briefly present the outline of her book project which studies the 19th century fascination with the mind and weaves compelling case studies from urban and rural Hungary and Austria into a sustained analysis of the psychiatric and popular cultures of the psyche. This provides the wider context for her research on medical hypnosis between 1880 and 1920 in the Hungarian Kingdom. She is interested in how the boundaries of science were questioned, blurred, negotiated or maintained in the face of potentially subversive explorations into elusive psychic phenomena, and will try to show what new insights the Central-Eastern European material and perspective may offer to our understanding of the emergence of the modern European mind. When? : Monday 23rd October at 16.00. Tea and coffee will be available from 15.30 in the Common Room. This entry was posted in Talks & events and tagged history of medicine, history of psychiatry, HSMT, Talks & Events, Wellcome Unit Seminars on 20 October 2017 by matkinson. Abstract: Responsible for ‘the world’s worst and most poignant medical disaster’, thalidomide was first formally marketed on 1 October 1957, in West Germany. Instructions for its withdrawal were issued 49 months later, by which time thalidomide-containing products had reached more than 50 countries across the world, including 18 in Africa. Following a pharmaceutical okapi, and via fragmentary histories – those of a man called Wolf, a WHO Travelling Fellow, and several hundred baboons – I focus on the surprising presence and uses of thalidomide in South Africa, 1950s to 1970s. I suggest that tales of this teratogen may be of significance for widening global histories of this drug and for those of medical science and the state in South Africa in the twentieth century. This entry was posted in Talks & events, Uncategorized and tagged history of medicine, HSMT, Seminar, Talks & Events on 12 October 2017 by matkinson. We are pleased to announce that electronic Access is now available for the Nursing History Review, the Official Publication of the American Association for the History of Nursing. 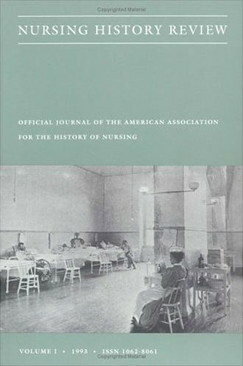 Nursing History Review, an annual peer-reviewed publication, is a showcase for the most significant current research on nursing and health care history. Contributors include national and international scholars representing many different disciplinary backgrounds. Regular sections include scholarly articles, reviews of the best books on nursing and health care history, invited commentaries, and abstracts of new doctoral dissertations on nursing and health care history. Historians, researchers, and individuals fascinated with the rich field of nursing will find this an important resource. Access is via OxLIP+, and is available from Vol. 1 (1993) to the present day. This entry was posted in Electronic resources and tagged Electronic resources, For Academics, For Researchers, history of medicine on 11 February 2015 by .